No matter where in the world you live, it's hard not to cringe at the current state of the United States' presidential election runup. Regardless of how you feel about Clinton or any of the third party candidates, it's virtually impossible to take the candidacy of Donald Trump seriously. He's managed to offend virtually every group of voters other than non-college-educated white men, and yet he still manages to capture the airwaves and set the terms of the entire election race. He's been impervious to scandals that would have toppled any other candidate in US history, but he may at last have met his match. Himself, in fact - naked, in parks across America. 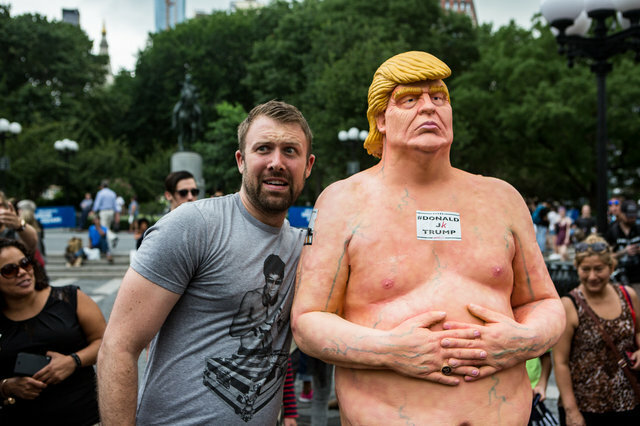 Courtesy of the anarchist artist collective INDECLINE, life-sized statues of Donald Trump completely naked appeared in many places, including Union Square Park in New York City, Los Angeles, San Francisco, Cleveland and Seattle on August 18th. The likeness is hardly flattering, and the title of the piece apparently is called 'The Emperor Has No Balls' - and, sure enough, the statues seemed to be missing the relevant part of typical male anatomy. Of course, parks officials across the country were not overly pleased by the guerrilla public art installations, and rapidly began to take them down, despite the hilarious and overwhelming support that they seemed to get from the general public, as you can see in the image on the right. Many more photos were taken and circulated around social media, ensuring that the memory of the statue will live on even after it's earthly presence has been removed. INDECLINE, the collective who are apparently responsible for the explained their choice of statues. “Like it or not, Trump is a larger-than-life figure in world culture at the moment. Looking back in history, that’s how those figures were memorialized and idolized in their time — with statues.” Their spokesman only commented with the Washington Post on the condition of anonymity, naturally. To cap it all off, after the New York City Parks Department removed the statue in Union Square Park, eventually NYC Parks spokesman Sam Biederman offered a statement about the event: "NYC Parks stands firmly against any unpermitted erection in city parks, no matter how small." Ouch. Here's hoping that INDECLINE has managed to puncture the windbaggery that has characterized the Trump campaign, and helped in some small way to save the world from his presidency.